← Making gamma ray bursts work for you! So it seems, a Ukranian radio telescope is being used to transmit a message to Gliese 581c. In fact, it already has — at 6am yesterday morning. 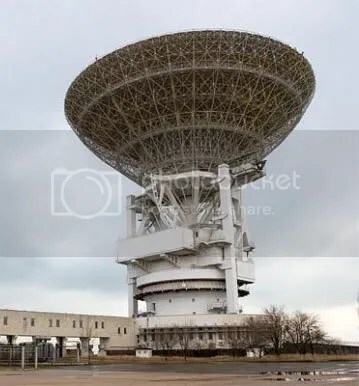 I’m just guessing here, but the telescope is probably UTR-2 (officially, “Ukrainian T-shaped Radio telescope, second modification”). If so, that’s pretty impressive. It’s one of the largest decametre radio telescopes in the world! It would be interesting to know exactly how powerful the signal would be — then you could rank it on the San Marino scale. I’ve written about that before actually. Coincidentally that blog entry concerned the same Dr Alexander Zaitsev involved in this transmission! The Sun, like any star, is a noisy thing. It emits a lot of radiation, which could easily drown out a weak signal. By the way, this means that no, aliens aren’t watching 50s american sitcoms somewhere. The original transmissions just weren’t powerful enough to leave the solar system. If UTR-2 can send out a signal at over 1000 times the intensity of the noise generated by the Sun, then anyone at Gliese 581c would receive a signal with a San Marino rating of 6 (Noteworthy). If it can manage 100,000 times the solar background noise, it would score an 8 (Far Reaching). This entry was posted in Imported from Livejournal and tagged planets, seti, telescopes. Bookmark the permalink. 2 Responses to Alien Social Networking?